Yes, it's true root vegetables tend to be overlooked and underappreciated. Most likely it's because they aren't very pretty but what they lack in the "looks" department they certainly make up for in taste. Included are things like parsnips, turnips, celeriac and even carrots. For the most part they are low in fat and calories while still providing loads of nutrients; making them a great food choice. Although easily found in the winter, when most other vegetables don't grow, and often very inexpensive most people just don't have any idea what to do with them. While anyone can cut up vegetables and roast them to bring out their sweetness, there are so many other ways these roots can be enjoyed. Like most vegetables they can be turned into fries, made into gratins, or chips and even whipped into a nice mash. 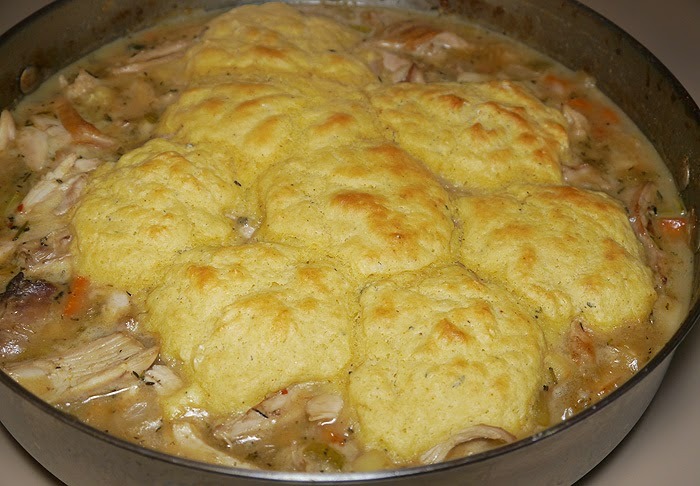 I recently enjoyed this hearty stew of root vegetables with shredded rabbit and homemade buttermilk biscuits. If rabbit is hard to come by, or just not your thing, I think this would be equally delicious made with chicken. In a large oven proof skillet over medium-high heat, add the rabbit and sear. Add mirepoix, and caramelize lightly. Deglaze the pan with the wine. Add stock and simmer until rabbit is tender. Cool and shred the meat from the bones. Reserve the juice. Sear vegetables in a pat of butter, until lightly browned. Add the herbs, garlic and wine. Reduce until pan is almost dry. Add about 1/4 stick butter and stir to melt without breaking. Stir in the flour until incorporated. Gradually stir in reserved juice. Cook about 30 minutes until roux taste is gone. Add shredded rabbit and season with salt and pepper to taste. Mix all dry ingredients together in a bowl. In another bowl mix all wet ingredients. Combine the two together stirring as little as possible. Form golf size balls and place over top of rabbit.